Today Hard disk drives are the most common storage device used with the computer system. The hard disk drive is also known as hard disk, hard drive,fixed disk drive or Winchester disk drive. The hard disk drive is used to store data and programs permanently inside the computer. The information stored in the hard disk drive does not get erased when the power supply to the computer is switched off. This device is known as “Hard Disk Drive” because compared to the other common magnetic storage device floppy disk, which used flexible plastic like carrier for the magnetic recording medium, the hand disk drive uses rigged, hard, aluminum or glass as the base for recording medium. Platters are coated on both side with a layer of magnetic material (called media) and covered with a protective layer. Finished and polished platters are they stacked and coupled to the spindle motor. Some drive might use only one platter. There is usually one head per platter side, so a drive with two platters should have four heads. The 3-½ inch size platter is currently most common with the personal computers, and the 2-½ inch is common in the portable laptop computers. The material using which the platters is made is called the substrate of the disk, on this substrate the magnetically media is coated. This media coating stores information magnetically. Initially all the hard disk drives platters surface was coated with some iron oxide compound. This media gives around 30 inch thick coating on the platter surface. Using electroplating process. In this process the platter substrate is immersed in different chemicals to coal the platter surface with a very uniform 2 to 3 micro inch thick cobalt alloy coating. to plating process. This process provides thinnest, hardest and finest media surface. In this process the platter substrate is first coated with a layer of nickel phosphorus and them on this surface cobalt alloy material is deposited using a sputtering process. Read/Write heads form the interface between a drive’selectronic circuitry and magnetic media. During writing, ahead translates electronic signals into magnetic-flux transitions that saturate points on the media, where those transitions occur. A read operation works roughly in reverse. Flux transitions along the disk induee electrical signaleds in the head, which are amplified, filtered, and translated into corresponding logic signals. Currently used r/w head is very flat, sensitive, small and durable, but even thin film heads use an air gap and 8 to 34 turns of copper wire. The heads are attached to long metal arms that are moved b7 the head actuator motor. The entire subassembly is sealed in the platter compartment, and in generally inaccessible, unless it is opened in a clean room environment. After the ferrite head technology next popular technology was metal-in-gap head. As the name suggests in this type of head, a metal allow is placed in the recording gap, on the trailing edge of the head. This metal is placed using the calcium depositing process called sputtering. Metal-in-gap head could write to hang density thin film media used in high capacity drives. But as the drive capacity increased there the thin-film head replaced heads. The arm on which the R/W head of the disk drive is located is called the “head slider”. Their sliders are made in a catamaran sailboat shape. A common slider size in today 3-½ inch hard disk drive is 0.08*0.017 inch. Slider of this size is called a “Nano slider” because of its small size. A spindle motor in typically a DC motor. On e of the major factors that contribute to hard drive performances is the speed at which media passes under the R/W heads. 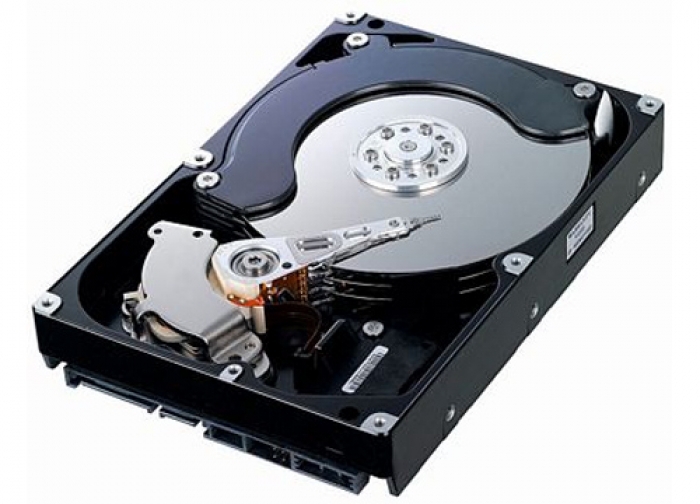 Other than the read/write head, spindle motor, head movement assembly, the hard disk also contains a logic board t control all these different parts of the hard disk drive. This logical board is also used to interface the hard disk drive with the computer. A hard disk drive may contain one, two or even their logic boards at the top at the back and at the bottom to the drive. Bezel is the front faceplate provided on most of the hard disk drives. Now days as most of the hard disk are connected internally and is hidden behind the pc systems cover the faceplate or the bezel is not needed. most of the hard disk drive today come without a bezel. Cables and connectors are used to connect the hard disk drive to the main computer system. Almost all the hard disk drive contains connector for 1) Data/Control (40 pin)interface connector, 2) Power connector. The read/Write head of the hard disk drive is moved on the platter surface using different mechanism, this is referred as head actuator mechanism. This actuator mechanism work on completely different principle. The head actuator is one of the most important parts of the hard drive, because different characteristic of the hard disk such as its r/w speed, accuracy, reliability etc. very much depend on the head actuator mechanism used into that drive. Unformatted storage capacity in millions of bytes. Formatted storage capacity in millions of bytes. Unformatted storage capacity in megabytes. Formatted storage capacity in megabytes. Hard disk has an electromagnetic read/write head for each side of each platter. So a drive with two platters should have three or four heads. Each side of the hard disk drives platters surface is divided into concentric circles called track. There tracks are not visible marks on the disk surface instead these are magnetic information written during the formatting of hard disk drive. The outermost track number and the next track is 1,next track 2 and so on, the innermost track will have the highest number. Number of track on hard disk may range from 300 to 3000. The number of tracks per surface is identical to the number of cylinders, so most manufactures do not report the number of tracks they report the number of cylinders. Where data is stored on the hard disk drive, it is stored in cylinder by cylinder i.e. first all the tracks of same cylinder is written, once a cylinder becomes full the read/write had moves to the next cylinder and writer balance data to the next cylinder. COMPARISON OF DRIVE PARAMETERS VS. CAPACITY. Designers realized that in these drives the data was recorded more densely on the inner tracks, where the circumference is lower, and less density on the outer tracks, where the circumference is higher. All of the tracks with in zone use the same number of sectors, but inner zones use fewer sectors and outer zones use more sectors. Current hard drives can run from 195 to 312 physical sectors per track. There are basic all three steps to the format process. data. Inner-sector and inter-track gaps are aloes created. Because this information’s only written once, age and wear can allow sector info4mation to eventually fail, when this happens, the failed sector’s are unreadable. This problem is further compounded by the fact that low level formatting is hardware. Specific and most current drive makers, low level format their drives at the factory. Sequence or software utility, one of four things might happen. The drive will accept the formatter and perform a correct low-level format. This is highly unlikely. Partitioning is an operating system specific process. After low level formatting is complete, the drive must be partitioned before can os file system or boot information is written to the drive. Several file systems are in service today but Dos Windows 3.1y and window 95 continues to use the FAT system. The main criticism of the FAT is that sectors are grouped and aligned as clusters. One of the newly created partitions will be assigned as the boot partition, and master boot sector (MBS) containing a special boot program and partition table will be written to the first sector. When Dos writes some inforamtion onto the hard disk, it does not allocate the space sector wise instead it used a new unit of storage called clusters. Cluster are the min. space allocated by Dos when storing any information on the disk.